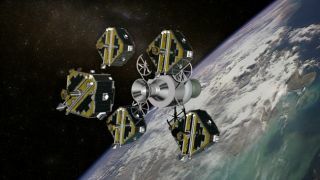 NASA's five THEMIS satellites are shown just after deployment in this artist's interpretation. They mayseem small and boxy, but five newNASA probes have a lofty purpose: sifting through the Earth’smagnetic field for the stormy beginnings of the planet’s most dynamic auroras. Set tolaunch in less than a month, NASA’s THEMIS spacecraft are designed to hunt downthe origin of substorm -- tempests of high energy particles that accumulatesomewhere in the Earth’s magnetic field, then flow back to the planet andsupercharge its auroraborealis – also known as the Northern Lights [image]. Theimpact of substorm particles – accumulated from the Sun’s solar wind – with the Earth’s atmosphere are responsible forthe shimmering ripples and color changes that accompany some of the mostspectacular auroras to date, THEMIS researchers said [image].But the seemingly aesthetic space weatherphenomena may also prove to be a building block for severe space storms capableof endangering astronauts inorbit, interfering with communications or harming satellites, they added. AUnited LaunchAlliance Delta 2 rocket is slated to launch the five THEMIS probes intoorbit from Florida’s Cape Canaveral Air Force Station during a 19-minute windowthat opens at 6:07 p.m. EST (2307 GMT) on Feb. 15 [image].The mission’s name – short for the hefty title Time History of Events andMacroscale Interactions during Substorms – is also taken from the Greek goddessof justice. Each about thesize of a dishwasher, the five THEMIS spacecraft are nearly identical, with anyone designed to fill in the orbital slot of its robotic brethren [image].Only four probes are required to complete NASA’s planned two-year and $200million mission – the fifth is a spare – but wrangling them all into launchposition is not without challenges. Afterlaunch, the first probe – dubbed Probe A – is designed to pop free of from itshousing atop the wedding while the other four deploy like flower petals [image].The spacecraft are then expected to extend a series eight booms that range fromjust three-feet (one meter) to 65 feet (20 meters) in length [image]. Each THEMIS probes comes equipped with 11instruments that include a pair of telescopes, six electric field instruments,two different magnetometers and an electrostatic analyzer. “Ourphilosophy was to keep the probes as simple as possible and leave thatcomplexity on the ground,” Harvey said. That addedcomplexity includes some 20 All-Sky camera stations and a host of ground-basedmagnetometers scattered across Alaska and Canada to complement the THEMISprobes’ findings. In order toscan the Earth’s magnetic field and pinpoint the origin of substorms, THEMISresearchers plan to stagger their spacecraft in different orbits that range inaltitude from 10 to 30 times the radius of the Earth (the planet’s radius isabout 3,962 miles, or 6,378 kilometers) [image]. The spareTHEMIS probe and two others are slated for a one-day orbit some 10 Earth radiiout in space, while two others will take up stations about 20 Earth radii abovethe planet. The final spacecraft is destined for a four-day orbit that reachesout to a distance of 30 times that of Earth’s radius. Their flight path alsobrings the five THEMIS spacecraft into alignment with themselves and Earthevery four days, when researchers hope will be a prime substorm hunting period. “It isamazing that these tiny probes will travel over halfway to the Moon,” Harvey said. Thedistribution allows the THEMIS probes to evaluate two candidate locations --one near the halfway point between the Earth and Moon and another closer in --for substorms. Mission scientists are hopeful they’ll record at least 30substorm events during the two-year THEMIS mission.